The bless name is Hazrat Maulana Shah Afzalur Rehman urf Bhole Miyan Sahab (rehmatullah alaih). Hazrat Maulana Shah Afzalur Rehman (rehmatullah alaih) was the(gaddi nasheen) care taker of Khanka-e-Rehmani, Gujmuradabad Shairf for more than 40 years and was a very learned scholar of his time he was a complete aalim & mufti, he was given the title faqih-ul-hind. Hazrat Afzalur Rehman (rehmatullah alaih) was a great kamil Auliya Allah, from the age of 7 years none of his namaz were kaza. He took the viel at the staircase of jama masjid, agra, India attaining both Fana and Baqa, The date of the parda is 1st Jamadi-Us-Aakhir, Tuesday, 1422 Hijri. Hazrat Afzalur Rehman urf Bhole Miyan (rehmatullah alaih) is such an Aarif and Kaamil, pious believer whose true sight penetrates and reaches at first glimpse the secrets and magnificence of Shariat and Tariqat, and Hazrat Afzalur Rehman urf Bhole Miyan (rehmatullah alaih) is that personality to whom hundreds of thousands of disciples (mureeds) have pledged the allegiance, and on whose hearts, his authority and command has been engraved. The proof that he was drowned in the love of Allah and that he was a true Aarif was the fact that he was always in the Zikr of Allah, chanting “Allah” “Allah” from the depths of his heart. He was so deeply engrossed in the wazifa called Sultaanul Azkaar which is mostly done by the people of Naqshbandiya Tariqa, that every part of his body would split into pieces, each making zikr of Allah individually and join back later by the will of Allah. His heart was so engrossed in the Zikr of Almighty Allah, When he wrote anything, it was as per the command of Almighty Allah and His Rasool (Sall Allaho Alaihi Wa Sallam) and when he said anything, it was in accordance with the command of Almighty Allah and His Beloved Rasool (Sall Allaho Alaihi Wa Sallam). When he walked, he walked in accordance with the command of Allah and His Rasool (Sall Allaho Alaihi Wa Sallam). Even though Hazrat Afzalur Rehman urf Bhole Miyan (rehmatullah alaih), had reached such levels of spiritual excellence, he never thought that he was exempt in any way from the commands of the Shariat. He use to offer namaz ba jamat. When in the stage of Istighraaq there was no one who could see in his eyes, the eyes would burn as if burning coal. His face use to become so bright and Noorani no one could withstand the Tajali-e-noori coming from his face and eyes. Although Hazrat was in the state of istighraaq, he never missed any of his Namaaz. There were certain people (with not much understanding of Istighraaq) who thought that Hazrat had loss of memory, some thought he have gone mad(MaazAllah), many of the family members who use to stay there use to think the same. After reading the above mentioned testimony, it can be said that Hazrat Afzalur Rehman urf Bhole Miyan (rehmatullah alaih) had reached a very elevated spiritual level which is known as “Ghaflatus Saaliheen” For the true servants of Allah, this such an elevated level of spiritualism, that on reaching this level, they have no memory of even the existence of the world (in other words materialistic things). Even though these pious servants of Allah reach such levels of spiritual excellence, these personalities never think of themselves as being exempt from the commands of the Shariat, but actually, as soon as the time for fulfilling any obligations of Shariat comes, they immediately come out of this deep spiritual state and fulfill their obligations as per the Shariat. when people bought his blessed body back to the khanka-e-rehmani it was already 3 days he had died but his body was not decomposed nor it was smelling as other people do, the body was full of dirt due to his contiues (chilla) siiting at the jama masjid. He never left the place whether it was day or night. There was a tremendous change of whether, some time it would rain, some time it would be so hot and all of a sudden there would be dip in the tempreature making it cold, but there was nothing that could stop him from going from Fana to Baqa. The only thing he was waiting for the answer for his beloved that i except u my servant in the list of my friend. 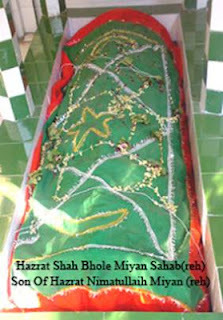 When the gusl was given to his blessed body, Hazrat Afzalur Rehman urf Bhole Miyan(rehmatullah alaih) in his life time has said the names of the people who would give him gusul, the same people were giving gusul to his blessed body every one was heart broken as they have lost their kamil pir and were in deep sorrow, as the gusul started Hazrat Afzalur Rehman urf Bhole Miyan(rehmatullah alaih) opened his eyes the people giving gusul were shocked he looked and smiled at all of them giving gusul to his body he did this for 3 times and then closed his eyes finally, He showed the mureed that i am not dead but i have traveled from one place to another and that is why it is called "Parda" in urdu which means veils. when veil is there between u and some one opposite to u cant see what the person on the otherside is doing. His mazar-e-akdas is made in Khanka-e-rehmani next to the mazar sharif of his Pir Shab Hazrat Rehmatullah Miyan sahab(rehmatullah alaih) who was a "abdal" and grand Son of Hazrat Maulana Fazl-E-Rehman Gunjmuradabadi(rehmatulla alih) he was the care taker of the silsila before Hazrat Afzalur Rehman urf Bhole Miyan(rehmatullah alaih). Hazrat Shah Afzalur Rehman urf Bhole Miya(rehmatulla alih) was having many mureed spreading the silsal-e-rehamniya all over the world, many of the mureed were living in bihar, india. He use to visit Bihar many times for spreading the islam and silsal-e-rehmaniya. One day a mureeds friend came to meet him he told his friend that he is facing a problem with her daughter the friend asked what the matter was, he replied that her daughter is disturbed by a jinn once she was on the terrace at magrib time and the jinn took her away somewhere and she came back the next morning, many time this thing has happened so i am very afraid what to be done now, i have told this matter to many Aalims and buzurg but was of know use, on hearing the whole matter the mureed replied that dont u worry my pir sahab(rehmatulla alih) is coming today u come in the evenig i will tell him the matter inshaAllah every thing will be souted out. Which means that go away you jinn other wise i have to come personaly, as soon as the shoes were kept from that night (subhanAllah) the girl was not taken by the jinn and the jinn told the girl plz dont call Hazrat Bhole Miya(rehmatulla alih) here instead i am leaving u my self. What a buzurg-e-Kamil Hazrat Maulana Shah Afzalur Rehman urf Bhole Miya(rehmatulla alih) was when his shoes has so much powers how much powers he might have this is what you get when you surrender totaly to Allah and his Holy Prophet(SalAllaho Alahi WaAlehi Wasalam) you dont have any thing in particular but you rule the whole world this is the sadqa of Ishq-E-Nabi(SalAllaho Alahi WaAlehi Wasalam).